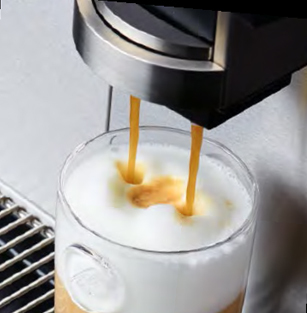 The fully automatic coffee machine Melitta® Cafina® CT8 meets the highest demands with regard to performance and ease of use. Melitta® Cafina® CT8 - For large-scale requirements. Excellent coffee is always possible, round the clock, seven days a week. With the fully automatic Melitta® Cafina® CT8 you are always perfectly equipped for continuous operation and peak demand. A major customer in the food service industry was the inspiration for our top model. Their special requirements for performance, ease of use, beverage variety, and quality in the cup set the course for our developers. The result is a superlative coffee machine with functional design, which is attracting more and more fans in the global food service industry. The 10.4'' touchscreen display ensures clarity and quickly leads to the desired product. Product groups show all variations of a drink at a glance. Or simply pool a group of drinks: first, place several orders on the stack and then dispense them even more quickly. Or select self-service mode and let your guests choose themselves. 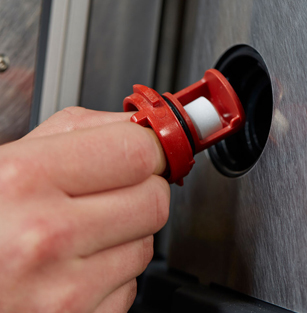 The newly developed milk system provides both cold and hot milk, as well as hot and cold milk foam, in variable and individually programmable consistency. However firm you want the foam to be: it is always delicious thanks to its highly homogeneous nature. 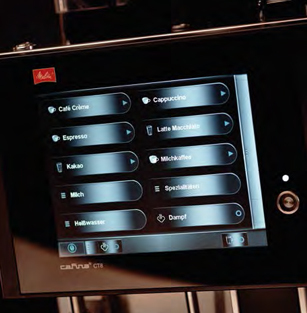 The inside of the Melitta® Cafina® CT8 is home to cutting-edge technology. 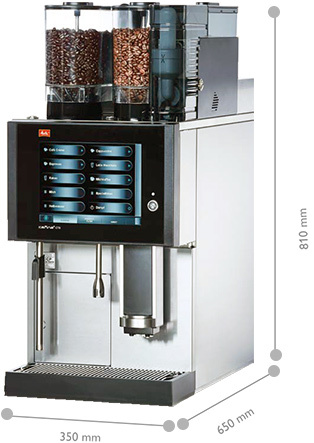 The sturdy metal brewing unit and - depending on the model - one or two high-performance grinders guarantee precision, durability and long service intervals. With two grinders, the grind can be perfectly adjusted to two different bean varieties. Thanks to its high-performance motor, the grinding takes less than two seconds and thus protects the coffee's aroma. Thanks to the micro-fine sieve, a fi ne grind results in a particularly high coffee yield - meaning greater economic efficiency. Also for the CT8 there are suitable attachments. From cup warmer to milk refrigerator up to the (non-cash) payment system or the cocoa dispenser. Finden Sie einen Verkäufer in Ihrer Region und lassen Sie sich beraten.